Find hotel near Municipal Museum Of Amalf ..
A perfect place for history buffs and for anyone who is interested in getting to know history and culture of Amalfi. 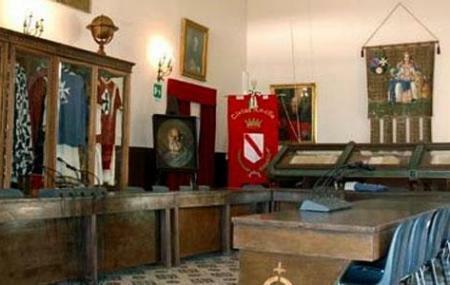 This one room museum has on display objects like costumes, military uniforms and capes; and artefacts that tell stories about Amalfi’s rich past and about the time when it was a maritime power – including a version of Tabula Amalphitana, a maritime code with rules in navigation in the Mediterranean. Also on display are ancient instruments and objects used by naval officers around early 1700s. Visitors also get to admire famous mosaic paintings at the entrance of the Museum. Take SITA bus to Amalfi Municipio stop. How popular is Municipal Museum Of Amalfi? People normally club together Ceramiche D' Arte and Minori while planning their visit to Municipal Museum Of Amalfi.